A tiny C12 single-cell church with C13 lancets, standing in a field. Some post-Reformation alterations date probably from both the C17 and C18. Since 1510 the living has been united with the equally small one of Wiggonholt (Dallaway II(1) p272). 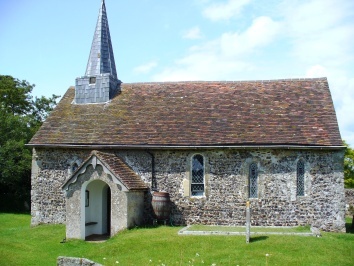 The modest ironstone church stands close to the manor and its plan is a slightly irregular quadrilateral, without a chancel arch. The walls are relatively low in proportion to the width of the church and this, like most surviving detail, points to a date not before the earlier C12. Particularly indicative of this date is a blocked single round-headed east window between the present, later east lancets. Its head is formed from a single stone bearing two bands of shallow saltire decoration. On the other hand, the jambs of a tall and narrow north doorway recall the C11, but in view of the weight of evidence in favour of the later date, this is likely to be an instance of structural conservatism. Some disturbed masonry in the east part of the south wall may mark a further window of this period. Lancets include the two east ones with a plain niche between them inside. All have rere-arches without scoinsons so they are relatively early C13. 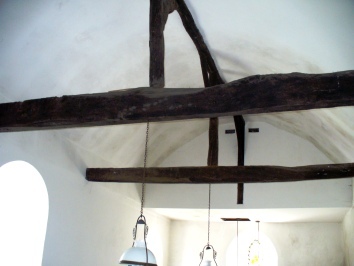 The roof has led to some discussion (see 3), but its simple timbers, apparently kingposts braced from east to west, date probably from this time, though obscured by later plastering. 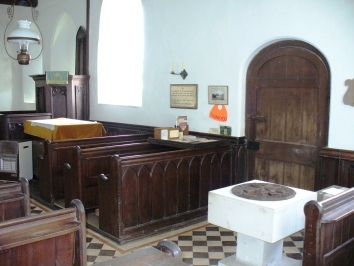 Probably in the earlier C17, the chancel was marked off from the nave by slender wooden pilaster-like strips each side, perhaps during repairs after the survey of 1602 which recorded the chancel as ‘muche in decaye’ (SRS 98 p71). 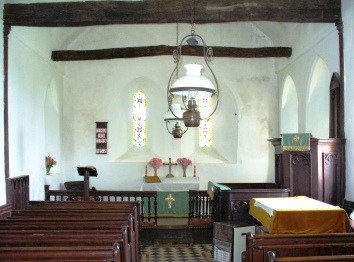 The south porch and doorway may also date from then (the latter is not C12, despite a round head), as may the nave window east of the porch which is too broad to be mediaeval. The Sharpe Collection drawing (1805) shows the church much as it is today except for the belfry which was of conventional Sussex form with a small pyramid on top and sides that were almost certainly boarded as they had been in 1602 (SRS p98 ibid). Today this is entirely slate-hung (there were others covered in the same material but most were shingled in the C19), with a small polygonal spire on top. It is quite possible that at least its frame could be C17, since the belfry had been recorded as in need of repair in 1602 (ibid). Adelaide Tracy in 1849 (II p43) showed it as it now is, but with a round finial at each corner. Neither a more precise date for the slate-hanging nor that when the finials were removed can be ascertained. Regrettably, after severely damage in the storm of 1987 (1 p93), the belfry was not examined during the ensuing repairs. In the north wall is the outline of a vestry of uncertain date, which disappeared around 1950 (1 ibid). There were few other few changes to the structure in the C19 and the interior is still plastered. The rustic fittings (see below) are later than might appear, probably mostly mid-C19, and form an interesting group. Oil lamps and candles remain in use. Altar rails: C17 with simple turned balusters and crenellations running along the side of the top rail. Font: C19, with a plain square bowl and a single slender stem. Monument: Harriet Godbold (1823?) by E Outridge (Roscoe p931). 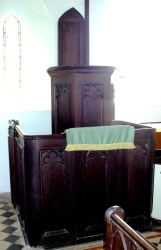 Pulpit: A two-decker, with desk and pulpit combined, which has lost its sounding board. Like other fittings the panels are decorated with cusping and they are probably mid-C19. There are similarities to the fittings at Houghton, which date from 1857.